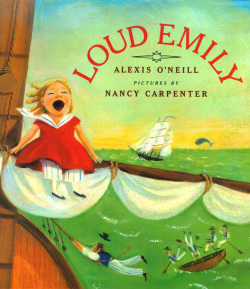 In this boisterous tall tale filled with authentic sailing language, the voice of a little 19th century girl in a whaling town shatters not only plates, but the peace of her parents. Rather than sailing off to Miss Meekmeister's School for Softspoken Girls as her worried parents wish, she ends up auditioning for Captain Baroo who needs someone to call commands on his tall ship. The crew adores her voice as do the whales. When the ship is tossed in a storm, Emily calls the whales and together they save their ship and many others from harm. Emily finds her place in the world, and the world (and her parents) appreciates her gift. A rollicking tale with a likable heroine that attests to the irrepressible nature of children. O’Neill crafts a charmer … Emily’s quest to find her place in the world, without altering herself in the process, will encourage anyone who has ever felt different from the crowd. An appealing nautical tale … O'Neill's language has a roll and verve that captures her young heroine's spirit perfectly. Part tall tale, part stage show. . . this hero is a small child and she's powerful. Alexis O’Neill makes sailing terms fun for kids to say — and shout. Loud Emily sings a halyard chantey as the sailors hoist the sails. Click below to hear this Irish Rover version of the halyard chantey, "Blow the Man Down." You can find the lyrics here. Check out this video from Mystic Seaport Museum where you'll hear a capstan chantey while sailors haul the anchor.